"Farm Help On The Way" with a girl cow, customizable to your anticipated delivery month and year. 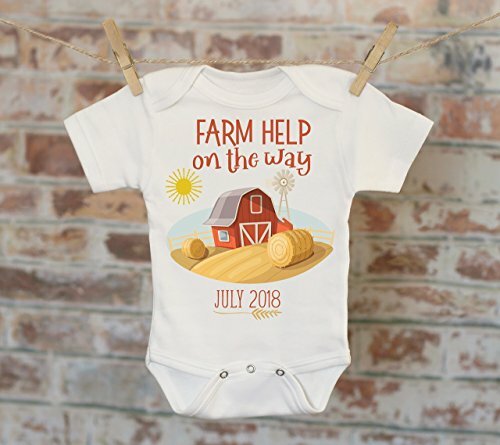 Announce to the world when your newest family addition is arriving! Perfect for a baby shower gift! **** Welcome to Witty and Bitty, your online source for cute and fun baby and toddler clothes. Our Onesies and shirts are printed using professional garment inks, permanently embedding the ink into the fabric for maximum durability. This process ensures the design will last through many washes. If you have any questions about this product by Witty and Bitty, contact us by completing and submitting the form below. If you are looking for a specif part number, please include it with your message.